All this week I am on location shooting an ambitious corporate film for a major technology company. The film is going to be showing lots of cool new technology in action, and as such, it’s been my job to get all that kit working for the camera. I have always been a techno-geek, so this job has been lots of fun – but I have to tell you, I have discovered something extraordinary. And yes I know, many of you will have already been there and got the T shirt, but… Guitar Hero on X-Box! Who would have thought that strumming a guitar or pounding on a drum kit within the confines of game could be SO MUCH FUN! Right now I can hardly type after a gig that included Bon Jovi’s ‘Livin’ on a Prayer’ with an encore of Motorheads ‘Overkill’, complete with never ending cymbal and snare drum pounding, sweat inducing drum solo! And what a workout and stressbuster. Sardines in the production office! The office has never been more full – right now, our tiny twelve foot by eight foot space is housing an entire production team for the corporate job we are undertaking (plus boxes and boxes of high tech props). It may looked cramped, it is actually, but it’s also a lot of fun. And because we are all in the same space, a very small space, we are constantly eaves dropping on each others phone calls and problems, and as such, can offer immediate advice, contacts and tips to each other. It’s crazy but surprisingly productive. Alongside Judy and myself, we now have Helen Taylor and Matt Grinter on our team. What’s really great about both of these guys is that they are very active in the current film making scene and so have loads of contacts with others who are also very active right now too. It’s a constantly evolving landscape out there, and for someone like me, someone who may spend six months ‘off the scene’ while writing, their up to date knowledge is vital. So much to do. So little time to do it. Starbucks is my new office! Starbucks is now my new office. With their Coffee Card, I can get free wireless at any Starbies, which means I can spend a whole day sitting in my new office, taking meetings and making Skype phone calls in between. Of course the Skype headset does make me feel like I am in a call center! Starbucks even have power sockets everywhere, so you never run out of juice. Looking round in this Starbies, EVERY person has a laptop and is doing some kind of business. I am here with Gen and Zee today, making plans for the future projects for Living Spirit (movies, courses for the summer and books too). We have a huge amount of possible projects to pursue and every one of them is very enticing in some way or another. Foremost in my mind though is something my good friend Eddie Hamilton said to me the other day… I will be taking ‘bigger’ meetings next week and ‘everyone is going to ask if I have a feature script that is like Gone Fishing.’ Of course I do, I have Rocketboy. But is there something else that I am missing, something that is much closer to Gone Fishing and therefore builds on the success both at festivals, and also the success the actual film delivers as an experience? People really like the movie. Other films that come to mind are ‘Ghost’, ‘City of Angels’, ‘My Name Is Joe’, ‘A Matter of Life and Death’ and of course, the granddaddy of them all, ‘The Sixth Sense’ (which is often called a horror film but is really a drama with a paranormal twist)… the answer right now is no, I don’t have a film like that. So I am ‘blue sky’ing’ ideas right now. And if you get a great idea, I would love to hear it. Yesterday I wrote about how Variety ran a short piece on their site, which in turn precipitated interest from Miramax… you can read the Variety piece here. Well 24 hours later, I got an email that was almost EXACTLY same, but this time, from Working Title here in the UK. They have already agreed to attend a screening next week on 35mm which is fabulous news. That’s a wonderful offer of help, and serves to underline how important just one tiny mention in a magazine like Variety can be! It's 5.42 and Johnno, first AD turned up 30 mins early. I love film industry pro's, no-one is ever late. Right now I don't feel much. Not tired. Not excited. Not daunted. Just focussed. I am planned. I have a great team. We can do this and it will be awesome. Let's see how the day plays out. See you in 16 hours. 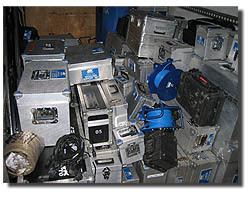 A few hours ago, the camera truck arrived and I took a pic of the contents for this blog. Blimey! Look at it all. Two 35mm cameras and all the bits. Not much like an HDV camera and tripod is it! Right now I feel like I am strapping myself into a rocket ship and about to press the big red button. It’s a mixture of trepidation and excitement. I would say that I can’t sleep, but I am so utterly exhausted, I will be asleep in seconds the moment my head hits the pillow. 1. The casting of the kids in the movie. This is a world class junior cast that I can’t really see how it could be improved. Thanks to Cathy Arton. Casting director. 2. The script and storyboards. Every other film I have made I have known that the script could have done with more work. Not so on ‘Gone Fishing’. Whatever we may think of it when we get on set and into the edit, right now before we start shooting, I know I could not improve it as it is on the page tonight. Same goes for the storyboards. 3. Camera and kit. 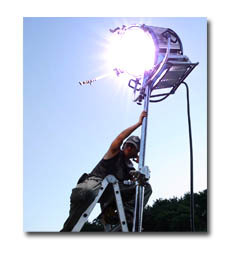 We have world class cameras, hi speed cameras, second unit cameras, tons (actually yes, 18 tonnes actually) of lighting kit. Stuff. We got it! And it’s all top notch. 4. Crew. There are a few members of the crew who blow me away. Cathy Arton, casting director, Vernon Layton, DP, Steph Wrate, in production, Jonathan Andrew, First AD, Eddie Hamilton, Editor… And I have so many new crew members to meet and work with tomorrow. Really, world class folk. There is other stuff I know that could have been improved, but that’s all compromises borne out of a lack of time and money. So as I sign off for tonight, and shower before the first day of the shoot, I sleep with a sense of security. I know I am working with great people, that we are prepared as much as is possible within our given circumstance, and that the script, the very foundation of the project, is both moving and inspiring. Every person who has read it has commented on how much they loved it. That alone is it’s own reward. Final organisational touches are now coming together. This is a kind of fluidity to production that is very tiring - dates, crew, cast, locations, all interdependent, all changing regularly. It’s most frustrating when people pull out knowing the huge impact it has on us, even though they have been involved in negotiation and things have been made clear from the start. We just lost out number 1 actor last night, this after three weeks of saying they like it and we were just negotiating terms. They eventually just said they had decided not to do it. No reason. We have second and third place choices for sure, but this was devastating as everyone was poised to go in – Linda Haysman, costume designer for instance now has to think about new costume hires and now three days before we shoot. Agents act as a buffer for actors and often I don’t feel they convey the urgency of a situation to their client. In fact, I am not sure they convey anything at all! I suspect if actors were in direct contact with producers, this would never happen. Sure, have an agent agree terms, but get the creatives talking ASAP. Of course the agent does not want this as that reduces their negotiation powers. Sadest of all, agents don’t seem to really recognise that we are not the BBC, or Warner Borthers or some other fully funded body. For most agents, it’s one size fits all. Some agents on the other hand, the ones who have bothered to really find out about what we are doing, have been amazing. I mean really amazing. So there is hope. This is all, of course, just the stuff that happens on a film. I have done it enough times now to know that we will get through it, nonetheless, we were organised and ready, but they let us down, and now we are disorganised and not ready… Today will be hard work, but we will get through to the other side. The pics here are shot by Ross Edwards who visited set to help build for an afternon. Thanks Ross. Today was the first day that I really had that feeling of 100% immersion in the film making process. Where nothing else matters. 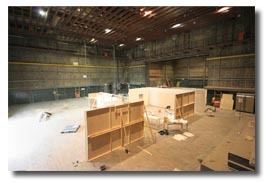 It began at 8am, stage 3 at Ealing Studios, a huge sound stage that we managed to get for the sets for Gone Fishing. 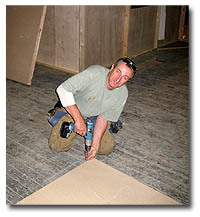 Set construction began with Mark Sutherland at the helm, and I immediately felt at home. Mark built sets for both ‘White Angel’ and ‘Urban Ghost Story’, two of my past feature films. Production Designer Emily Johnson oversaw the construction of her designs, and after a little false start, Mark began to ‘Whack it up!’ Then to my surprise, production designer Simon Pickup turned up to lend a hand. I was delighted to see him as I hadn’t worked with him since ‘Urban Ghost Story’. Amazing! My office for the day was the rear part of Stage 3. How cool was that! Every few moments I was either on the phone or being asked questions. This thing is, as the director, you end up being a kind of walking encyclopaedia on your own movie, and end up being in contact demand to consult. Then came the really great news. 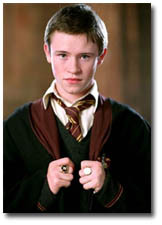 I dashed over to ComicCon at Earls Court where I met up with Devon Murray, the young actor who plays Seamus Finnigan in the Harry Potter series and who also starred in ‘Angel’s Ashes’. I had popped over to see him yesterday, and he read the script last night, loved it and now got onboard. This is TERRIFIC news as I was very concerned that the part of Young Bill would have to played by a boy with little experience and charisma. The part requires a young actor who can say huge amounts in a short space of time, showing a real character arc and growth, and also handling the physically arduous task of capturing the man eating Pike in the story. Devon will be a real asset to the movie. FANTASTIC! Hopefully we will get news on the actors playing Old Bill and Emily tomorrow. As the set continued to be built, I then got bad news. Production Designer Emily Johnson is now leaving for a paid job (though there is still an outside job she can stay by managing both for a few days). This has been a recurring blight for ‘Gone Fishing’. I really do understand that on a freebie job, if a paying job comes along, you need to take it. It’s just never happened that much to me, and even though I understand, it does leave us with big problems. This has happened several times now on this shoot and I think I can attribute some reasons. 1. Film making is much more common than it used to be, so people are less committed in general. And there is more to choose from too. 2. This is a short film and not a feature (I thought that getting people on a short film for a few days would be easier. Clearly I was wrong). 3. Production Design team members are the crew members who work the longest (aside from production) so need to sustain longer on no money. 4. The biggest reason by far is that London is a very expensive city to live in and few people can afford to work for free for any length of time. 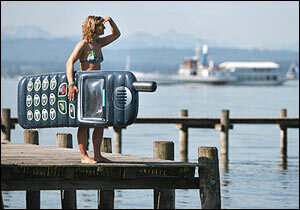 Emily assures me she will have a replacment on board ASAP and I am sure she wont let us down. Yesterday was hell. We had a few people drop out, a few production disasters that have cost needless money and hell, and I mean HELL from agents. Both casting director Catherine Arton and myself pretty much checked out last night… But then we had some GREAT news, which I can’t reveal just yet. Hopefully tomorrow we can reveal. 1. You get spammed out at their end because you used a banned word like ‘free’ (I am not joking) in the text. 2. Mac / PC attachments don’t work as they should. Mac people blame POC users, vice versa. 3. People don’t read emails properly, or at all in some cases! 4. You can’t get an immediate response from an email. 5. You need a computer to get email. Maybe a blackberry or push email. But all of the above still apply. 6. Over communication by needless forwarding or copying in on emails wastes time and resources. 1. No-one, especially girls, answer their mobile phone unless they have you in their phone directory. 2. People switch off their phone, effectively locking your communication out. 3. People can really call screen, so you can’t get into a conversation by stealth. 4. Assistants can’t collect messages from a mobile like they could on a landline, so it means only the person whose phone you called can deal with the message. 5. People don’t actually like being in 100% communication, you inevitably catch people at a bad moment, not at their desk, not when they are focussed and calm, and deals fall through. I know there are tremendous advantages to email and mobiles, but these disadvantages have proven to be a real pain. I have found that it makes people less disciplined when they need to communicate too. It’s all a bit irritating really. But hey, it’s the way the world has changed, so we have to roll with it. Life is so transitory. And yet making a movie, its very nature - the fusion of the ethereal idea made real by actors and sets, captured on film and sound, then made permanent through exhibition, be that on TV, DVD or cinema in a way that can live beyond the life of the creator of that experience - it can kind of make us a little crazy. Like ‘this movie will last forever’. I guess a little like the way Kings aeons ago would erect temples in their own image - maybe in our darker moments, making movies can be part of that whole negative ego and over inflated self worth. For me, it’s ultimately about taking a group of people on a journey and watching them as they go – I love to watch their faces in the flicker light of the theatre, listen to their gasps, laughs and tears. This is truly a magical business, where we manufacture dreams into tangible and sharable experience. Blimey. I must stop writing my blog late at night!